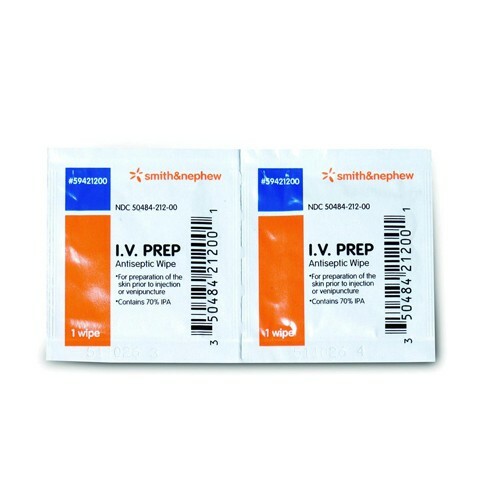 Smith & Nephew IV PREP Antiseptic Wipes come in a convenient, single use package. This antiseptic wipe is designed to sterilize and prepare skin prior to a ventipuncture or injection. 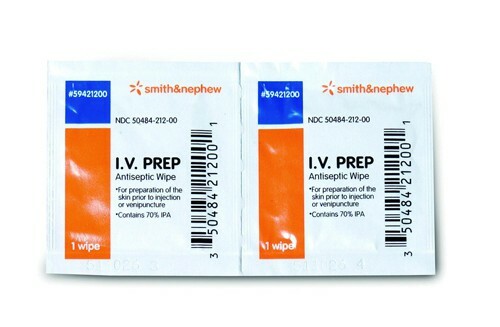 The Smith & Nephew IV PREP Wipes are easy-to-apply, highly effective, quick drying, reduce bacterial contamination, and is cost-effective. It is easy to use in four simple steps: 1- wipe and clean the area of the skin, 2- start at the ventipuncture site and apply in a circular motion, 3- wait for the antiseptic solution to thoroughly air dry, and 3- repeat with a new wipe if necessary. This product is flammable and must be kept away from fire and flame. It is designed for external use only and should not be used near the delicate area around the eye. There is a wide variety of cleaning wipes and antiseptic wipes available at Vitality Medical with low prices and fast shipping. What is the difference between I.V. Prep and Skin Prep by Smith & Nephew? Do both have antiseptic qualities? Do both have a skin barrier to prevent irritation by adhesives? The skin prep dressing wipes cleanse the skin before application or removal of a product such as drainage tubes, external catheters and other dressings. The IV skin prep is for cleaning the skin before applying a needle or I.V. of any source. While trying to find my diabetic husband IV preps for his insulin pump, I stumbled onto this site and good not believe the pricing ! These are a good 75% less than what he had just paid at a local medical supply store. I bought 2 boxes so that he would have a lot. Thanks for the great prices and very quick shipping. What we need at a great price ! I have used these for years and they work very well. The price is the best I have ever found. I enjoy using this product to help keep a inset for my insulin pump intact for the 3 days before I change it again other products I used seem to allow inset to become loose after showering 1 time and this product has not done that yet in 3 1/2 years todate. If you need some type of infusion device to stay in place use this specific product it works great. The only thing that works every time to prep before I use my Omnipod. Great price and fast service also. Thanks! I have tried other products& this one is by far the best! I use this product for site preparation for the inserting and wearing of a medical device. It does the job well, and leaves the site slightly sticky so that the device and tape adheres quickly and securely. It is one of those things that you make sure never to run out of! For anyone who is a Diabetic and on a insulin pump you understand how important it is to have a product that helps to keep you infusion set attached to your body of the 3 day duration between changing your inset, fo anyone who does not but may need help keeping a device of some type adhered to your skin this product hold up well. I would recommend it to all who need that ability to keep something adhered to you for what ever reason you need it.